You may have seen something recently on Steve Dolinsky's (aka The Hungry Hound) new pizza tours here in Chicago. He also has a book titled Pizza City, USA set to be released soon. During his research for the book I followed on instagram as he hit up spot after spot in the Chicagoland area trying as many recommendations as he could. He got to alot of spots and I look forward to reading his thoughts when they come out. Chicago is after all a great pizza town. Today's post is more proof as it's a place he happened to miss by which I mean just wasnt aware of as it's impossible to try them all. Still I was surprised to find how little there is online about Sano's on Lawrence in Jeff Park. Mike Gebert at Fooditor (and Sky Full of Bacon) used to do an ongoing series called "Great Unknown Pizzas of the (insert Chicago area here)" and I feel like Sano's is the type of spot he seeked out when doing so. It's a classic establishment that has the feel of a 1970's Chicago pizzeria. The space inside is narrow and long. Almost like that of a diner. Greeting you on your right when you enter is an old school Fauld's Pizza Oven which I learned about in the aforementioned unknown pizzeria series. 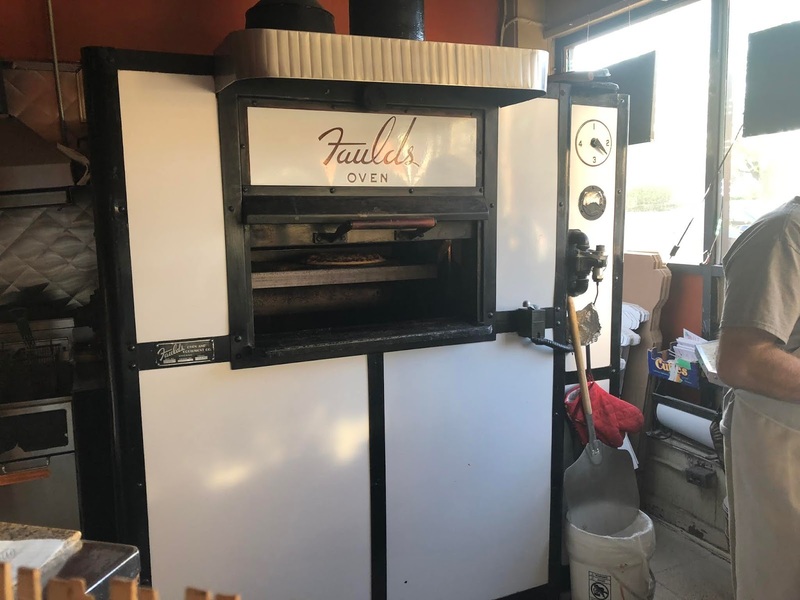 Fauld's is a now defunct company out of Chicago that used to build pizza ovens for pizzerias around the country. There's still a handful in use including one at Pat's Pizza which is what I grew up on. The namesake Frank is always at the oven making pizzas. It's an open air kitchen so to say. Sano's has been around since 1977 so you know they're a neighborhood favorite. On my visit they were doing a real nice delivery and pick up business with a few folks dining in. I decided to try a medium sausage and asked them to leave it in a bit longer as I witnessed a regular do the same as he placed an order. The pizza came out looking and smelling wonderful. The sausage which came from a big bucket of fresh locally made stuff was fantastic as was the placing of it. The pizza was a bit thicker than I like with a tad too much cheese but the fennel sausage was delicious and I always like a little bit of cornmeal at the bottom of a tavern thin. You could tell this pizza was made by a pro. Thanks for the shoutout. I have in fact ordered from Sano's, though not in years and years. It is just what you say. If you like this kind of pizza, Capri in Rockford would be worth a drive. They crank out a ton of tavern style pizzas here. I will give that Ridott's Corner a try as that burger looked damn good. One unique place in Rockford deserving of a review is a little burger joint called 15th and Chris (for its location). They make some really interesting combinations you don't see everywhere. The owner is really cool too.